Martha Stewart is my organization guru. I am a subscriber to her "Organizing Tip of the Day" Newsletter and am constantly amazed by the ideas generated by her and her team. It always made me wonder just how organized her house must be. In one of the latest issues of Martha Stewart Living, I got my answer. Martha opened up her kitchen (in her Bedford, NY home) and all of its glory to her readers. 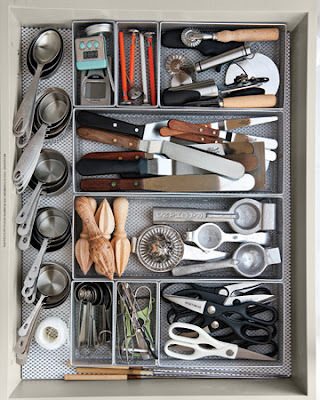 I consider myself to be a pretty organized person, but let me tell you, when I saw her kitchen drawers, I immediately knew I had some work to do. Lucky for me, I'll be heading to Dallas, the birthplace of The Container Store, this weekend. When you see just how well organized a space can be, you don't ever want to go back to that sloppy mess you had before. Organization is almost a design within itself. Perhaps that why I like it so. Don't you love this pot rack? 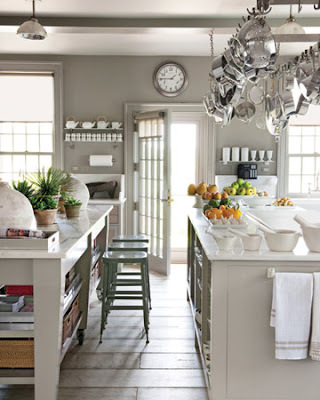 I would love to have one in my next kitchen. 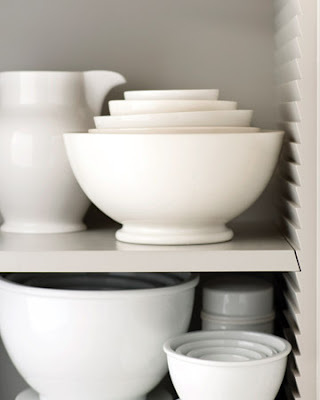 They are great for keeping your pots supper accessible and also free up a ton of cabinet space, which should be used to hide the things you'd rather not see. 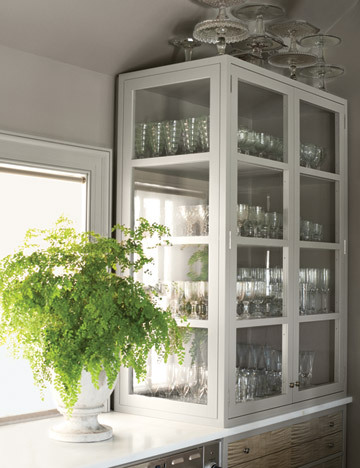 Adjustable shelving is a must when trying to maximize storage space. But, I can definitely do without those tacky holes on the side of the cupboards. This carpentry style is a notch support system called bird's beak. There are no holes and no prongs to mess with. Not to mention, it looks so sleek and fabulous. Good choice, Martha. I don't know about you, but my small tool drawer looks nothing like this. But with a little sorting and wire baskets mine, and your's, definitely can. 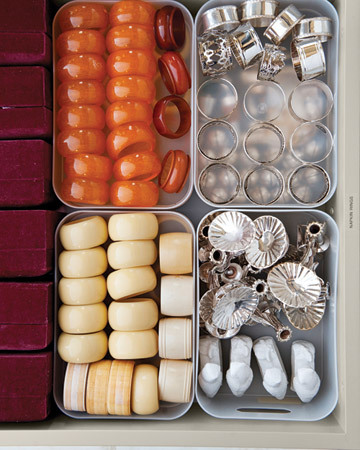 A drawer only devoted to napkin rings... sounds like a wonderful excuse to go out and buy more! 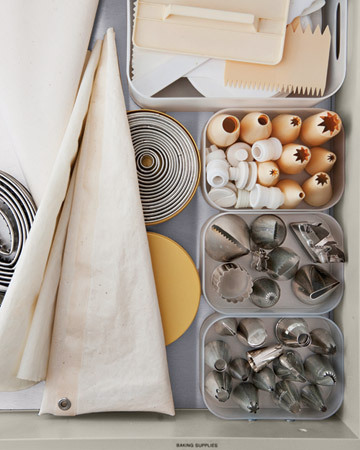 All of your cake decorating tools organized and easy to see. A much better idea than pulling them ALL out of the box every time you need one (which is exactly what I've been doing). Glass cabinetry helps your room feel much more large and open. And can you please check out her huge collection of cake stands on top? She makes me feel as if I don't own enough.